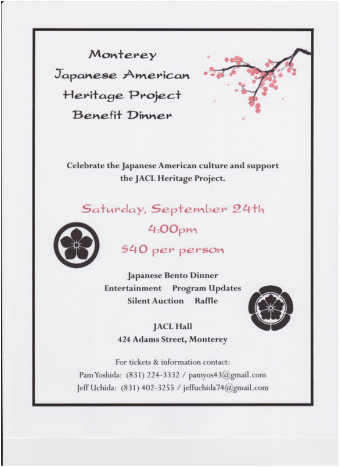 On Saturday, September 24, 2016, JACL/HC held its popular fundraising dinner from 4:00 to 7:00 p.m. at the JACL Hall located at 424 Adams Street in Monterey. A tasty, authentic Japanese bento dinner was cooked and served by members and friends of the Heritage Center. Percussive entertainment was provided by the taiko drumming group Shinsho-Mugen Daiko. Those attending viewed a special 10-minute video produced by J.T. Byrne, a local peninsula school student. This short film is about the history and uplifting impact of baseball on the lives of Japanese Americans during their years in the WWII internment camps. At the event, a silent auction and raffle prizes added fun and enjoyment. All proceeds will go toward JACL/HC projects. One of our current Heritage projects is the production of a 26 minute documentary film about the original 1945 petitions signed by local citizens welcoming back Japanese Americans from the internment camps. David Schendel, producer and videographer, shared some words about progress and goals for this documentary film. We plan to have this documentary integrated into secondary school curricula, available to colleges, and shown on television stations. Another key project is the JACL/Heritage museum featuring artifacts, images and documents that represent the history and cultural heritage of the Issei and Nisei on the Monterey Peninsula. Under the curatorship of Tim Thomas, the museum is progressing nicely and will be open for viewing by dinner guests.